We knew we couldn’t visit Argentina without enjoying one of their world-renowned steaks. After hearing about a can’t-miss deal from Meg and Tony at LandingStanding for a 1/2 price happy hour we made Parilla La Cabrera one of our first stops in Buenos Aires. 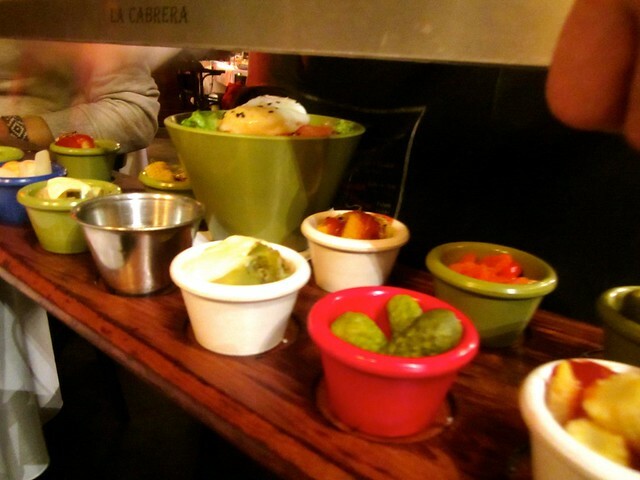 We were staying in the Palermo Soho neighborhood, so La Cabrera was only a few blocks away. The deal is if you show up and eat dinner between 7-8PM you get 50% off your entire meal (wine and all). For one of the most expensive parillas in the city, this is a great deal. The thing is, you have to finish your meal by 8PM. We heard the line starts forming around 6:45, so there we were, in line for dinner before 7 in a city that doesn’t start dinner until 10 PM. We were surrounded mostly by tourists and budget travelers who were anxiously waiting to stuff themselves with meat. The doors opened and we were quickly sat and asked to order. Being the chatty group we were, we asked for uno momento to decide. Big Mistake. One minute turned into 15. We had the option to be the first group in the restaurant to order and we ended up being the last. Tip: Grab a menu while you are in line waiting so you and your group can decide what you want to order prior to sitting down. 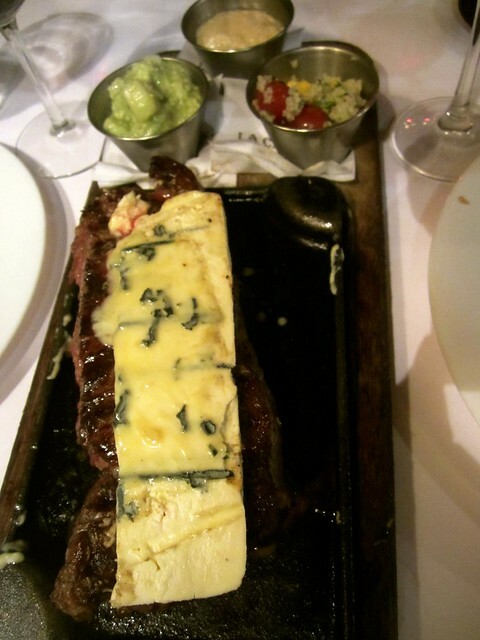 We had 4 in our party and each couple decided to split the Bife de chorizo con queso roquefort, a 400 gram steak with a slab of roquefort cheese on top. Not sure how much food was enough, we ordered a caesar salad, an order of french fries and a bottle of wine for the table. We didn’t realize that the meal comes with bread and a whole tray of small but filling options for sides. The bife de chorizo itself was delicious, especially with the cheese on top. It was a huge slab and 400g was honestly a huge amount of food even for two people to share (Josh probably ate 2/3 of it :)) The sides are great, with small salads, pickles and other tiny accompaniments. Since we were chatty and didn’t order on time, our food didn’t come out until around 7:45, which gave us 15 minutes to eat. We scarfed it down, and luckily they let us stay about 15 minutes past 8 while we were paying our bill and we were able to finish the meal. Lesson learned: definitely order the first time around! As with any other meal in Argentina, it’s not complete without a nice bottle of Malbec, and that’s 1/2 price too! Every day of the week except Monday and Friday La Cabrera offers a flat 50% off the entire menu, wine included. We got out of there for under $40, and enjoyed two of Argentina’s most famous gastronomic accomplishments: steak and Malbec. Next time we would skip the side dishes to save even more and not be as full! I hope you enjoyed your stay in Buenos Aires 🙂 As a native, I must say I’ve never tried eating “asado” or steaks on restaurants…I find them quite disappointing, but that steak looks nice indeed! I’m not a big fan of Palermo Soho as it’s full of expensive crappy food, but may suggest visiting Cafe San Juan (San Telmo) next time? You can try the rabbit in chocolate sauce. We will have to try Cafe San Juan next time! More competition for a good cut of meat! My husband and I are not planning to visit South America any time soon (unfortunately), but I think I’d better hide this post from him nevertheless… otherwise I can imagine him throwing our plans out the window just so he can sink his teeth into that steak! It looks amazing, and at 50% off, I can’t imagine there are many better deals to be had in the city! Thank you for the useful tip. Eating out can be so expensive and this shows how starting early can save you loads. It definitely helped us save money, and 7 pm is a typical dinner time for us anyways! We didn’t mind not waiting until 10 – 11 pm to eat! Thanks for the great tip! I will be in Buenos Aires in a few weeks and this may prove very useful information. Looks delicious! Let us know how your steak experience goes – Our was incredibly delicious 🙂 I found a new love for Malbec’s while in BA! La Cabrera was our favorite steakhouse in BA. Didn’t know they had happy hour! Funny how 7pm is an early dinner. Gotta love the late night culture. Yup, it was crazy how the streets were more alive at 3AM than 9PM!